Moskovskaya® Vodka has revealed its first ever Limited Edition bottle of the legendary vodka brand that traces its history back to the Russian Empire. Proving the origin of pure Russian vodka, the design of Limited Edition is based on traditional characters of Russian fairy- tales – the Bear and the Eagle – and was created by the Lithuanian Advertising Agency Not-Perfect and British designer Iain Macarthur. The Limited Edition of this legendary vodka keeps the signature shape of its well recognized Moskovskaya® bottle, decorated with the special design. Distribution of Moskovskaya® Limited Edition has already commenced with its home markets and will be followed by Spain, Italy, Portugal, Lebanon, Georgia, Austria and other markets later this year. Moskovskaya® Vodka is rapidly expanding its worldwide presence and is now available in over 40 global markets, including Central America and the US. Global brand sales are reporting 9% volume growth in 2016, and Amber Beverages are very upbeat about their ambition to raise sales volumes by another 50% this year. This ambiton is based on the consolidation, and further expansion, in vodka’s core markets, together with a strong focus on the Americas and the UK in 2017. Global brand director, Renatas Alekna (Amber Beverage Group), is positive about the input of Limited Edition into the global brand growth agenda: “By launching this first ever Limited Edition of Moskovskaya® Vodka we look forward to engaging with the dedicated brands consumers around the world, and at the same time we see a Limited Edition as one of the ways to enhance the visibility of the brand amongst the other mainstream vodkas”. The global brand development is also supported by a new communication strategy to build a single-minded brand globally. In keeping with its unpretentious nature, the brand is restarting its active communication with its consumers in an engaging, and straight-talking, way. 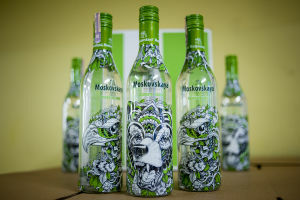 The rich history of Moskovskaya® Vodka, one of the most long-standing vodka brands in the market, is closely linked to the vodka-making traditions of Latvijas Balzams production facility in Riga, Latvia.